What's so special about second surface printing? What’s so special about second surface printing? Here's a question that, as a busy business owner, you may have not asked yourself in awhile: When was the last time you updated your signage? According to the Sign Research Foundation, 60 percent of businesses experience improvement in sales – 10 percent or more – by adding or refining their signage. So, what's the best way to make your point of purchase or retail signs really grab attention? Designs using vivid colors and appealing images certainly help, as does refreshing the graphic to a more current style. Sometimes simply replacing the graphics from years of abuse is all that is needed. However, if you're looking for a way to take your graphics to another level, there's an "outside the frame" way of stylizing your signage that may be new to you. It's called second surface printing, and depending on the type of sign you need, it can really take your visual messages to the next level. "Second surface printing adds a layer of complexity to your signage that is visually appealing." What is second surface printing? 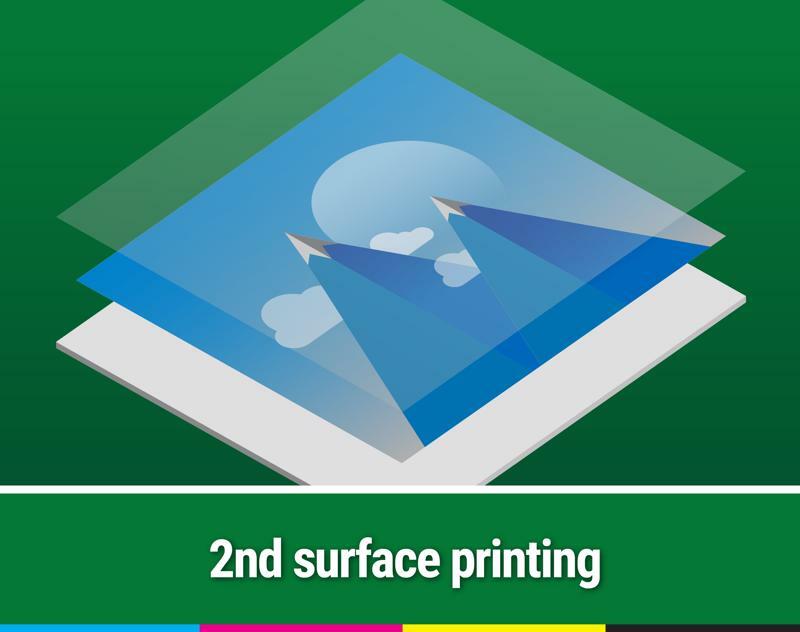 In the printing world, you may hear the term "printed 1st surface" or "printed 2nd surface" and wonder what that means. When dealing with clear materials like acrylic, polycarbonate, PETG, Lexan, or vinyls as a printing substrate it is important to know which side of the clear material the print should go on. While all materials have a front side and a backside, clear materials can be printed on the front or the back for a different visual effect. Printing on the front side is always considered the 1st surface and is the most common practice. When printing on a standard paper at home, you are essentially printing on the 1st surface no matter how you orientate the paper in the printer. However, only when printing on clear materials does the printing industry need to designate which side. Printing 2nd surface means that the provided artwork will be mirrored (i.e. reflected) and printed on the clear material so that the end user looks through the material to see the printed graphic in the correct orientation. Think of it as if you're printing on the back of the material but will be looking at the image from the front side and through the material. Why should I consider second surface printing? Second surface printing has many benefits and the main advantage is the clear material substrate acts as a barrier and protects the image from wear and tear. Whether the application is a window graphic, floor decal, or overlay membrane graphic, the printing is typically done on the backside of a clear material (2nd surface) so that the ink is not exposed to the elements. This extra layer of protection can add years of life without the cost of an additional laminate. Rigid clear materials like acrylic, PETG, or polycarbonate that are printed 2nd surface also tend to have a higher end look to them as opposed to 1st surface graphics. Second surface printing is common throughout the POP display industry for making headers and endcap displays because they make the display itself look expensive and attractive. This is partially because it adds a level of depth and gloss that can't be duplicated otherwise. Viewers notice the thick rigid substrate material because they are actively looking through it as opposed to 1st surface graphics. Window graphics like static clings can be mounted on the inside or outside of the glass. If the graphics are mounted on the exterior side of the glass, then the image should be ordered for 1st surface printing. These exterior mounted graphics will be more vibrant and have less window glare but will be exposed to the outside elements (e.g. weather, UV rays, vandalism). Alternatively, window clings can be also mounted on the inside of the window facing out where you'll frequently see at shopping malls or store fronts. Second surface window graphics are protected from the outside elements but do get more glare and less color because the viewer must look through the glass window and the substrate to see the image. The application depends on what the priority is. Second surface printing entails printing on the reverse side of the primary image, usually with white ink. If you haven't noticed nearly all printing requires a white backside behind a printed image. Usually the printed substrate is white and it's an after thought to how the colors achieve their vibrancy. Having a white is necessary behind a print because it acts as a primer for the transparent CMYK digitally and screen printed colors. Similar to painting your house on top of a darker color without a primer, your new color will be significantly subdued and won't look as intended. Since 2nd surface printing is done on a clear instead of white material, a primer must be added after printing as an additional step. This additional primer can be a laminated white material that covers the entire printing surface or it can be printed using a white capable printer so that the white primer is selectively added to go behind only the printed areas. Print providers who don't offer a digital printing press that prints white ink or offer screen printing capabilities aren't able to print 2nd surface printing and won't promote it as an option. It's important to know what your service provider is capable of so they can give you good advice and options. At NGS Printing, we have wide format digital printing presses in the Fuji Acuity F that print white ink as well as four different wide format screen printing presses that add white at ultra fast speeds. With options, NGS Printing can offer value and quality when ordering 2nd surface printing. If you're a retailer, consumer brand, or display manufacturer searching for window graphics, see-thru signs, overlays, window clings, overlays, or POP display headers printed on clear rigid plastics; NGS Printing has your covered. We have the expertise and capabilities to provide you with the highest quality 2nd surface graphics in the industry. By NGS-admin|2019-04-04T11:00:00-05:00April 4th, 2019|Digital Printing, General|Comments Off on What’s so special about second surface printing?